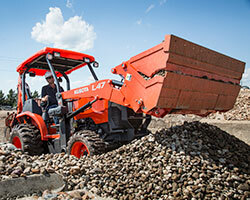 Kubota introduces the new L47 and M62 tractor-loader-backhoes (TLBs) with features designed to meet the needs of the construction, landscaping and rental sectors. Both TLBs are more powerful than their predecessors, and comply with Tier 4 Final emissions regulations. An optional hydraulic coupler, available on both models, enables easy attachment and detachment of auxiliary implements. The M62 has a 14-foot maximum digging depth, a 17-percent improvement over the previous model. In addition, the backhoe features a quick coupler system for a fast exchange of buckets, and a four-point rear mounting system allows the backhoe to be easily removed and reattached.